Wendy Ramshaw CBE, RDI is one of Britain’s most distinguished jewellers, and one who has helped, in the process of a long career, to reshape our perception of what jewellery can look like. Born in Sunderland in 1939, she studied at Newcastle-upon-Tyne College of Art and Industrial Design, Reading University and the Central School. 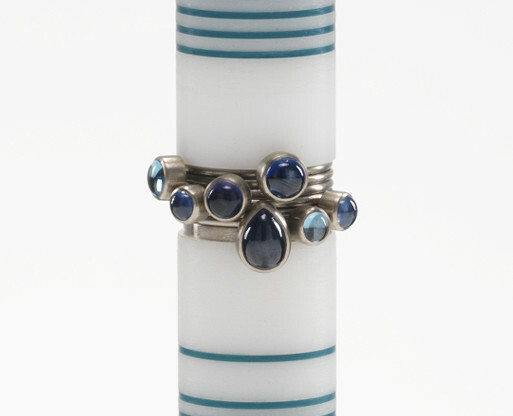 She is probably best known for her celebrated ‘ring sets’, rings displayed on miniature stands or posts that have sculptural and futuristic qualities, and which have given jewellery a new sense of presentation and context. Indeed Ramshaw’s great achievement is to make us think of jewellery as integral part and enrichment of a broader built and designed environment, not a confined and specialist field. Ramshaw’s style, geometric and crisp, ranges from simple and direct pieces to quite complex sectional structures with both modernist and post-modern overtones in form and detail. She lives and works in London.